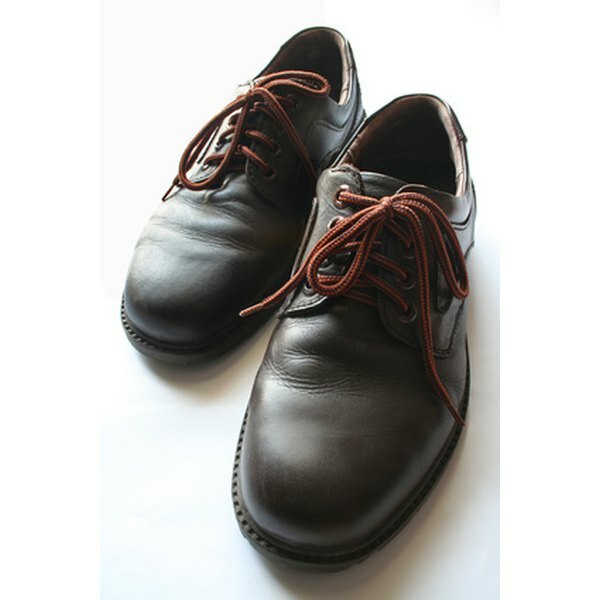 Leather shoes are easy to care for and repair. Leather shoes and boots are a common addition to wardrobes. If cracks appear in the material, it can be expensive to replace leather shoes or send them to a professional to fix them for you. With a few tools, you can repair cracked leather shoes and boots yourself without having to empty your wallet to cover the cost. Clean your leather shoes or boots. It is easiest to repair the cracks when you start with a clean surface. Use a dry brush to remove any caked-on dirt or debris from the shoe or boot. After the top layer of dirt is removed, use a shoe dauber to rub saddle soap into the leather. Work in the soap until the leather becomes flexible, then wipe away the soap and let the shoe dry. Apply mink oil to the leather. Stuffing a dish cloth into the shoe will help keep the shoe stiff as you work the mink oil into the leather with the back of a metal spoon. Rub the oil over the cracks with light pressure until the cracks appear hardly visible, or at least less pronounced. Condition the leather. Apply shoe cream to the entire shoe to color the cracks in the leather and blend the color over the entire shoe. This will make any flaws left in the shoe even less visible. To help prevent future cracks in your leather shoes and boots, apply shoe cream once a week to keep the leather flexible. All supplies can easily be found at stores like Target and Walmart.